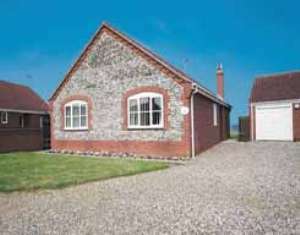 This large well-appointed bungalow has wonderful sea views being just a few yards from the excellent beach at Bacton. The private enclosed garden backs onto the sea wall with steps down to the beach, and the bungalow is fully double glazed to provide perfect year-round accommodation. There are several historic houses in the area, most notably Blickling Hall which is well worth a visit. For visitors with children there is a well equipped children's play area in the village to keep them entertained. There is good fishing, bird watching, sailing and several golf courses available nearby. Great Yarmouth offers a host of traditional seaside facilities including two piers, sealife centre, leisure centre, theatres and butterfly centre. On the North Norfolk coast east of Mundesely, Norwich, Cromer, Sheringham and the Broads are within easy reach, offering an excellent holiday base. Shop and pub 400 yards. Lounge, kitchen with dining area, bathroom with toilet, 3 bedrooms - 1 double with en-suite shower room with toilet & basin, 2 twin. Services: NSH throughout. Open fire. All fuel, power, bed linen (duvets) & towels inc. Garage for 1 car. Parking for 2 cars in drive. Cot & h/chair on request. Video. W/machine. M/wave. Garden with furniture. Two pets welcome. Easy Walking Access. Bacton Extensive sea views.